And – If first condition is true, apply and move to second condition. Or – If first condition is true, apply and do not move to second condition. If first condition is false, move to second condition. Rules always apply in order. Here are examples using price discounts for Board Members and also for early bird date ranges. Example #1 using AND as a next rule relationship. 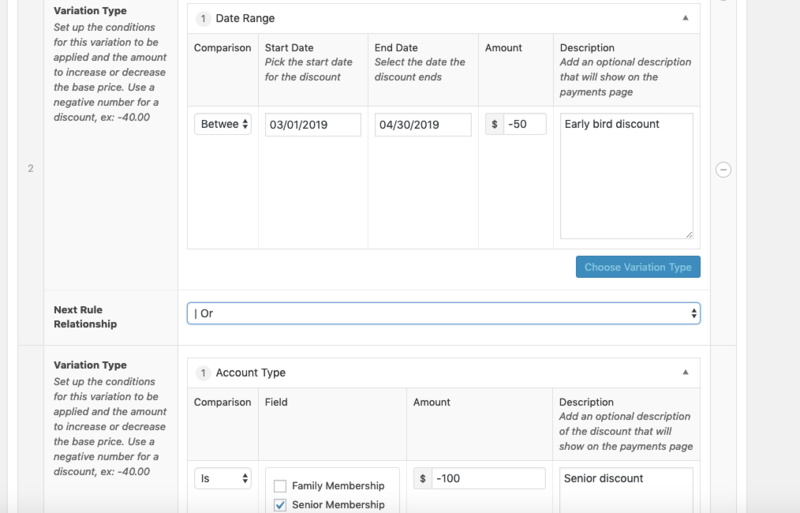 In this case, the member’s account would need to have an Account Tag of Board Member AND be completing payment within the selected date range in order to receive the two discounts of $350. The rules cannot act separately. Example #2 using OR as a next rule relationship. In this case, the logic would first look at the member’s account to see if there is an Account Tag of Board Member. If so, the $300 Board Member discount will be applied and no further conditions will apply. 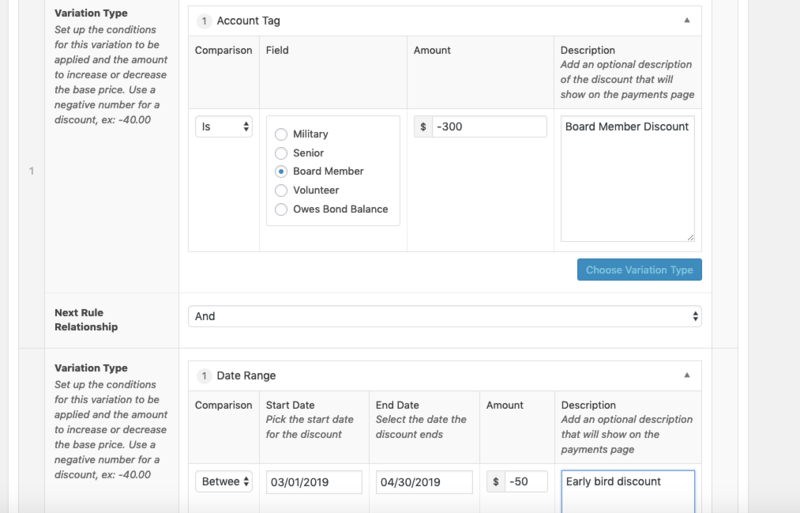 If there is not an Account Tag of Board Member, then the logic will move on to the second condition and check to see if the early bird discount should apply based on the date of the transaction. The two conditions are mutually exclusive. | AND and | OR are grouping options. They allow you to make logically grouped conditional expressions like: if ( A = TRUE AND B = TRUE ) OR ( C = FALSE ). There must be at least 3 conditions to use these. | OR If either of the first set of conditions applies, do not move on to the third condition. | AND Regardless of the outcome of the first set of conditions, move on to the third condition. Example #3 using “| OR” Let’s continue with Example #2 (above). The logic would first look at the member’s account to see if there is an Account Tag of Board Member. If so, the $300 Board Member discount will be applied and no further conditions will apply. 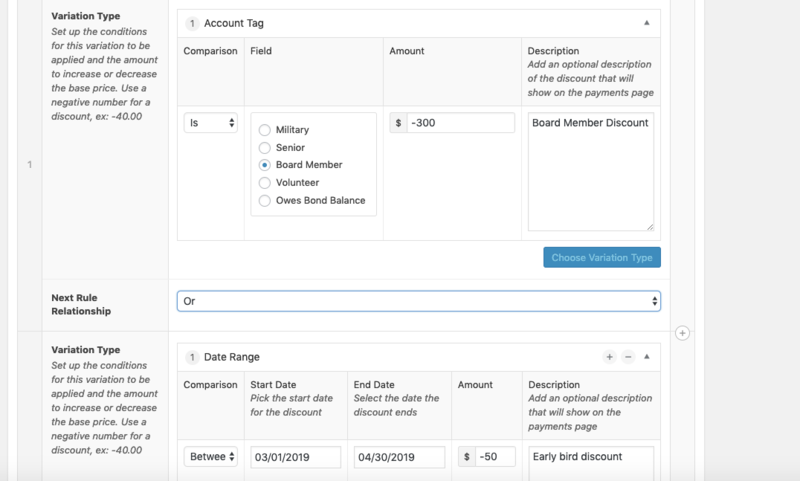 If there is not an Account Tag of Board Member, then the logic will move on to the second condition and check to see if the early bird discount should apply based on the date of the transaction. 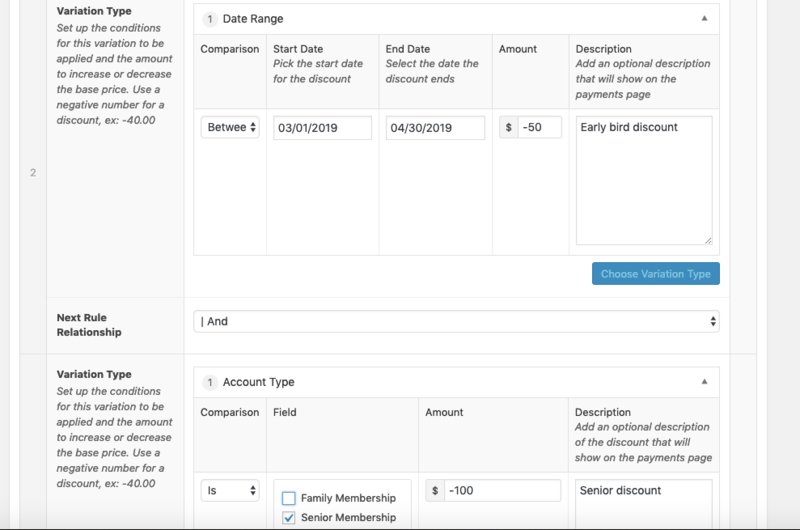 IF EITHER of those two conditions were true and a discount was applied, then the Senior Membership discount would not be considered. Example #4 using “| AND” Regardless of the outcome of the first two conditions, the last condition of Senior discount would be considered separately and the Senior Discount would apply if true. Copyright © 2018 Member Splash, Inc. All rights reserved.